Emory University's endowment value reached a record high of more than $6.7 billion as of June 30, 2015, earning a 3.6 percent return on investment over the trailing 12 months. Returns are lower than the previous 12-month period, when the university's endowment earned 19.1 percent on investments. Emory Investment Management (EIM), the group that oversees the endowment, continues to maintain a well-diversified portfolio, to invest with best-in-class external partners, and to seek opportunities to add value throughout market cycles. Emory's three- and five-year returns for the period ending June 30, 2015, exceeded 10 percent annualized, well above the long-term investment return targeted by the Investment Committee of the Emory University Board of Trustees. 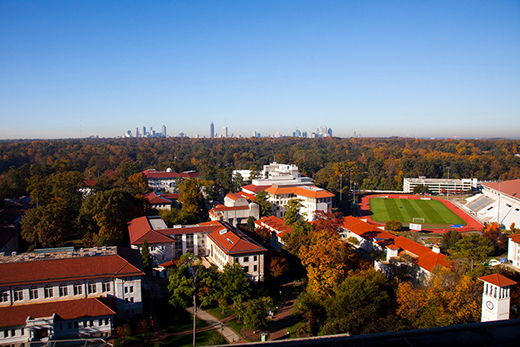 Emory's endowment was strengthened by philanthropic gifts totaling $72 million, representing continued generosity and confidence among donors. Growth was offset by net distributions of $258 million to support Emory's academic programs and research support. "During the year, headwinds from falling global energy prices were more than offset by gains generated in public equities, private equities and elsewhere in the portfolio," says Mary Cahill, vice president of investments and chief investment officer. "I am proud of our highly skilled and dedicated investment management team that works tirelessly to steward and grow Emory's endowment assets." "Emory continues to remain competitive among the nation's elite universities," says Mitchell Tanzman, Emory University trustee and chair of the Investment Committee. "Our investment team deftly weathered the market challenges this year with strong performance in equities — significantly outpacing the portfolio's benchmark in both public equities and hedge funds. This is a substantial indicator of EIM's outstanding management and stewardship of the university's resources."